GET YOUR TICKETS AT BROWN PAPER TICKETS! Acid tongued, unapologetically tenacious and devastatingly witty, the titular character of Windfall Theatre’s Prin is a loveable tyrant dressed in a crisp navy suit and heels. 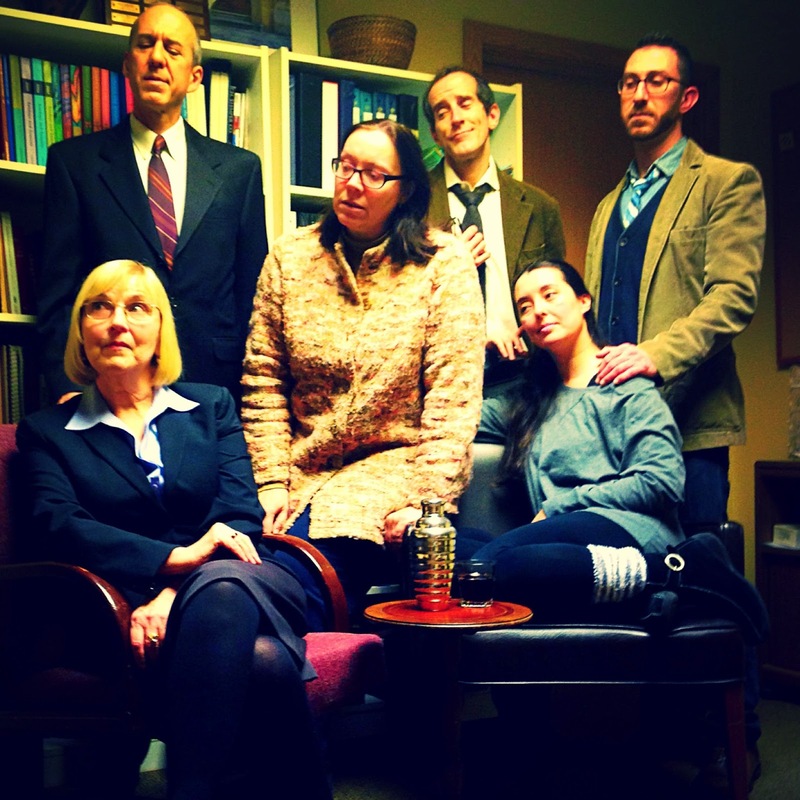 The show is set in the economically gloomy world of 1980s English academia. Headmistress Prin, played by the marvelous Michelle Waide, is locked in heated combat with those that want to merge her beloved teacher’s training college with the local polytechnic. If that were not enough, a scandal involving a dozy-headed English professor arises and Prin’s closest ally and protégée, whom she lovingly nicknames “Little Pig,” threatens to dismantle the only true friendship Prin ever had. The play’s set design is simple and unobtrusive. Most of the action takes place in Prin’s headmaster’s office, overlooking the college’s grounds. This led to some clever staging throughout the performance. Sometimes Prin would address the audience as if they were a class of graduating seniors. Seating around 50 patrons, the space made for a supremely intimate theater experience. By the show’s end the audience has thoroughly peeled away at Prin’s prickly exterior, exposing a wholly sympathetic character. 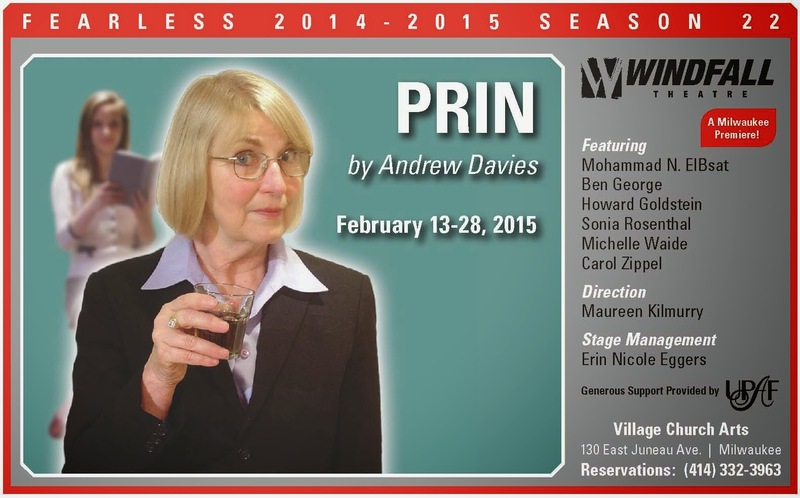 At its core, Prin is a comedy and it is a treat for those who prefer their humor on the drier side. Fast-paced dialogue, rich in sarcasm, is ample throughout the piece. Playwright Andrew Davies, perhaps best known for his adaption of classic literally works, expertly the weaves the audience through Prin’s chaotic life on campus. Director Maureen Kilmurry allows her characters move freely while onstage, sipping whiskey and tidying up the office, peaking the audience’s interest enough in a play heavy on dialogue and short on dazzling sets or action sequences. The cast, who all showcase very polished English accents, are exceptional. Waide’s Prin manages to create both a maniacal and lovable character. 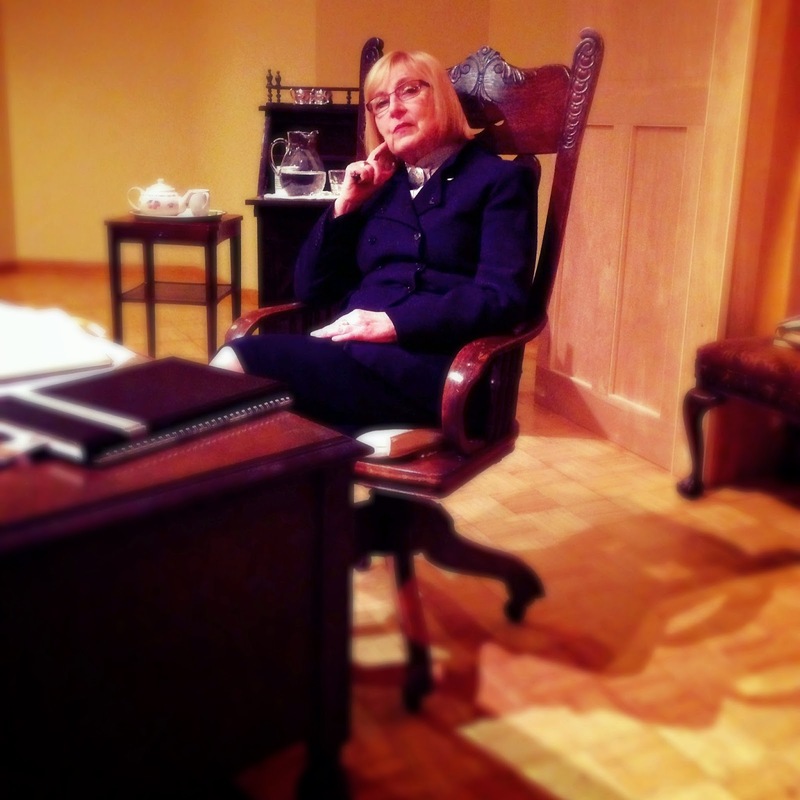 Carol Zippel, who plays the shy and rather frumpy Dibs, is the perfect contrast to Prin’s commanding presence. The show dabbles in themes such a lust, sexuality and feminism, but Prin is largely about the mediocrity of the public education system. It is obvious to see the similarities between Prin’s posh English prep school and our own educational shortfalls here in Wisconsin. Andrew Davies, a Welshman who early on settled in London, is best known for his film and TV scripts and adaptations. “Bridget Jones Diaries” is one of his big successes as is the popular “House of Cards,” currently playing on HBO. He has also adapted some of Jane Austen’s novels, an author that continues to draw a substantial audience. Davies, a writer who has garnered his share of awards, has only written two stage plays, one of which is now playing at Windfall Theatre. 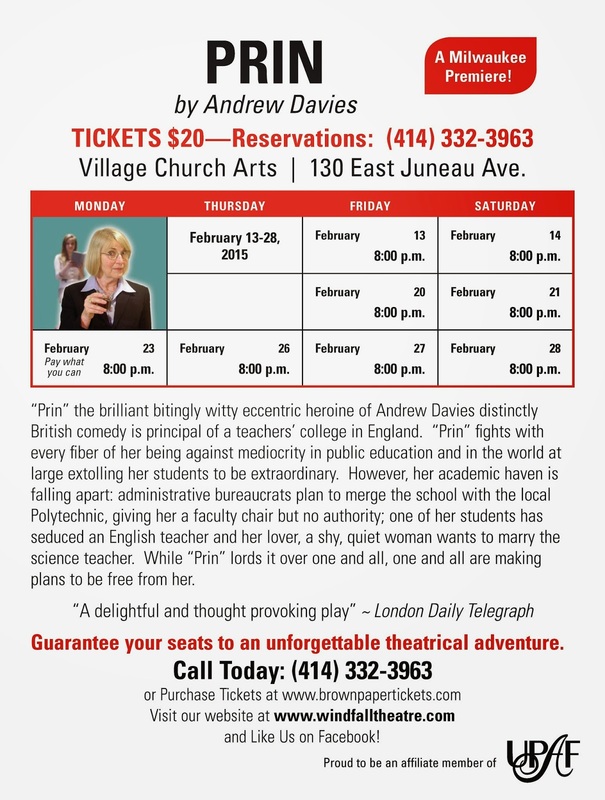 “Prin,” … is a comic drama replete with memorable characters, Brit wit and some provocative ideas about education and relationships. Michelle Waide… plays the key role as the unwavering Principal of a small, private college that educates teachers of physical education. She is a passionate believer in the significance of bodily movement and the pursuit of excellence. Carol Zippel plays Prin’s dear, dumpy Vice Principal Dibbs, who accommodates Prin’s every whim and is rewarded with constant berating. Prin sees herself as a superior human being and treats all the underlings around her accordingly. She is extremely rigid and disgustingly self-righteous, ruling her territory with intimidation and hiding behind the robes of higher education and lofty idealism. As a teacher myself, I found her “addresses” all too redolent of many of the clichés I’ve had to suffer through in my career. A stranger to change and compromise, Prin does not readily comprehend that her world is crumbling around her. One even feels some sympathy for her as her kingdom topples. As the play ends, we pity her for her emptiness and misplaced priorities. The four other characters that Davies has created are all a bit quirky but lovable. As they appear before their threatening boss, some stutter and cringe, while a few others take her on. The scene when Melanie, the student who has been carrying on with Walker, her English professor, and has also been quite willing to accommodate others in need, boldly enters Prin’s office, is fascinating as we watch how she reacts to Prin’s manipulative bullying tactics. Sonia Rosenthal as Melanie is excellent in the role. Walker, the offending English teacher, is endearingly memorable as he confesses and rationalizes his dalliance. Mohammad N. ElBsat aces this part. Boyle, the sorry little science teacher who loves to dissect rats, is well rendered by Ben George. He surprises us all when he eventually wins over Dibbs’ heart and gives her the courage to confront her surly, snobby boss. That scene is one of the best in the play. Zippel so beautifully portrays the transformation of Dibbs as the story progresses. The last character, Kite, the superintendent of education, is strongly played by Howard Goldstein. He is a match for Prin. We don’t particularly admire or like him, but we enjoy watching them spar for power. The play, well directed by Maureen Kilmurry, is rich with irony and provocative ideas about the mission of education, the role of progress and change, and the complexity and mystery of close relationships. It runs through February 28 in the Village Church on the corner of Juneau and Edison in Milwaukee. Call 414-332-3963 or visit their website at www.windfalltheatre.com for times and tickets. Watch the trailer for PRIN!